Is it Friday yet? It feels like that's all I ever do, count down till the weekend only for it to go by in a blur. I'm really sorry I opted out of posting the last few days. As I've said before, I've been really sick to the point where I can barely move around the room or sit. I prefer not going into too much detail though, don't wanna bore you guys to death. Anyhow, I got to thinking and it's been a while since I posted nail art. Wait... 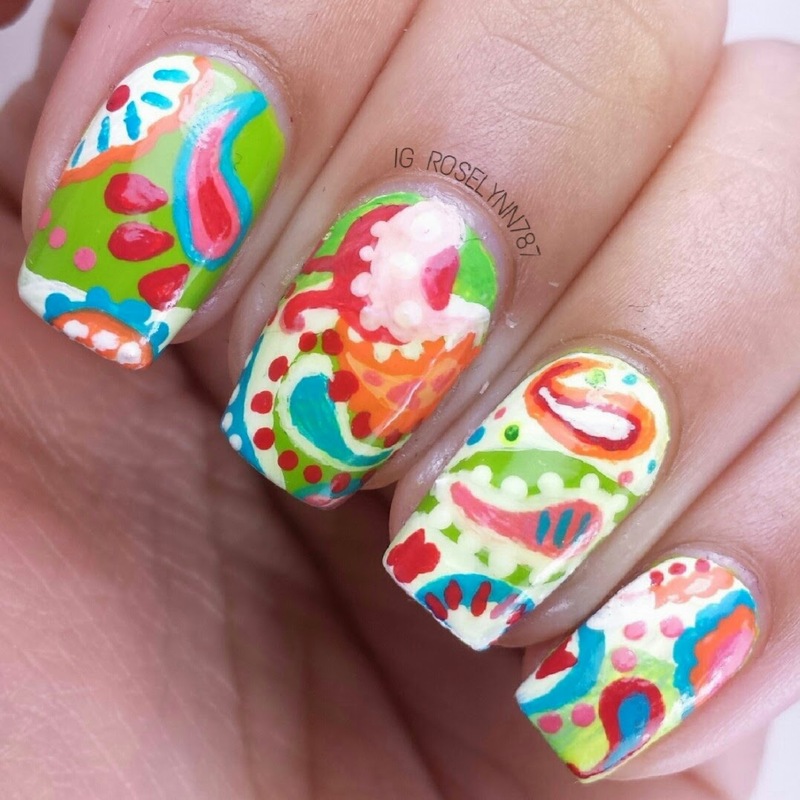 I did a nail art post a few weeks ago... Welp there goes that speech, here's some nail art any way. First design I have to show you all are my Paisley nails completed for Day 1 of the Random Nail Art Challenge May Edition. If you don't know about the challenge, it was created by @jamlynnailsy and @mawflowernails on Instagram. I love these challenges, it's a great way to step away from swatching and do things outside of your comfort zone. Usually I have a very hard time trying to do all the challenges so my bestie Cheyenne from CDBNails and me decided to make every challenge a #bestietwinnails thing as well. This way both of us get to push each other into getting art done. Awesome, right? These nails are almost completely acrylic paints as the only actual nail polish I used was the lime green base. The concept behind this design was inspired by an image both Cheyenne and me found on the internet without talking to each other first. One of the many reasons we say we're sisters, haha. Every part of this design was done freehand with a brush from Born Pretty Store (I'll be doing a review on the brush set next week). I think this might be the most detailed I have been in a long time if not ever. You won't believe how long it took me. Actually it's embarrassing, one nail took me an hour and a half. Just call me Ms. Slowpoke. Next design is for Day 4 and it's the Dry Brush technique! I have seen this done multiple times but have never had the time or the mojo to try it myself. Yay for challenges! This surprisingly has a lot more polish than my previous design. Actually now that I'm writing this, it's in fact an all polish design. Go figure. The polishes used in this design Zoya: Raven, Sinful Colors: White on White, China Glaze: I'm With The Lifeguard, and Bettina Aqua. 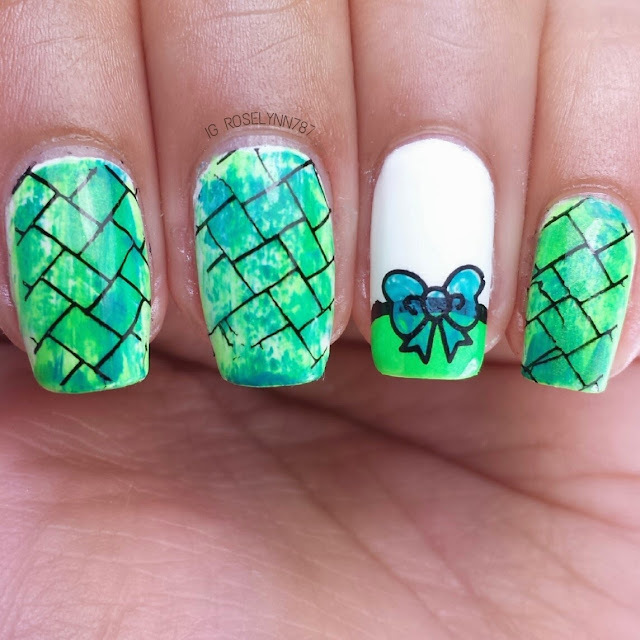 The one stamping plate is from Winstonia but not sure about the bow cause it was a nail mail gift. I love how some of the stamping didn't come up too well, I think it's because the plate itself is scratched up. But being messed up kind of makes it look more grunge and fits very well. So yeah.. I meant to mess it up ha. This design all came from Cheyenne, she picked out the colors and what stamps to use. Doing these challenges as bestie nails has got to be one of the best ideas EVER. That's actually all I'm going to show you with this post. I was going to add all the designs I've done but I don't want to make this post too long. I'll make another post later on to show you guys the rest if you'd like. Also a tutorial post for the dry brush technique will be up next week as well. Everyone seriously needs to try this at least once. Freaking easy and so stunning. Which of the two did you guys like best? 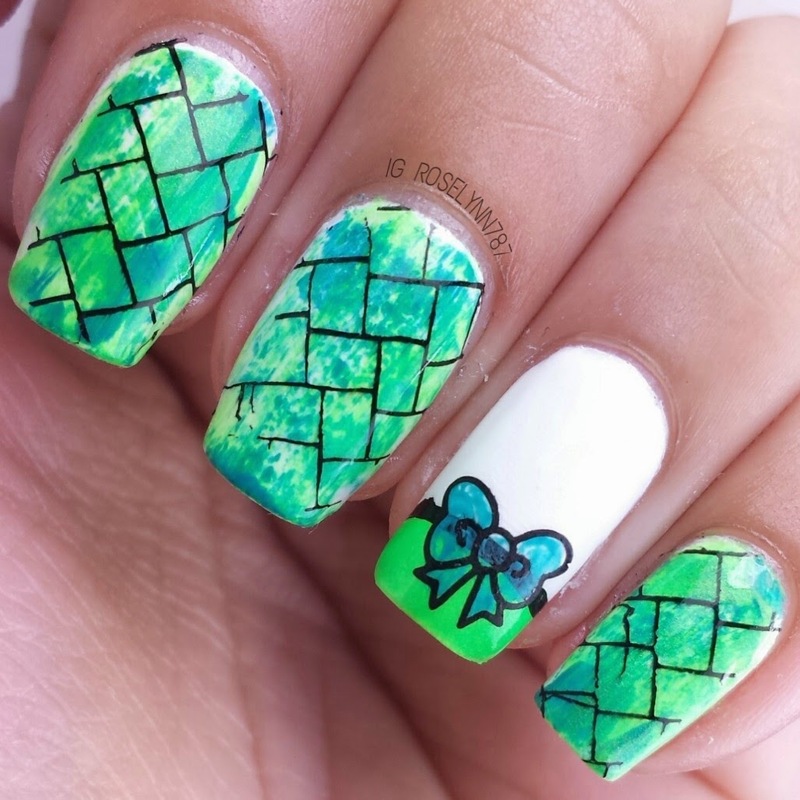 Are you guys part of any nail challenges this month? Talk to you soon amigos. I'm sorry you're sick :( at least you have awesome nails! 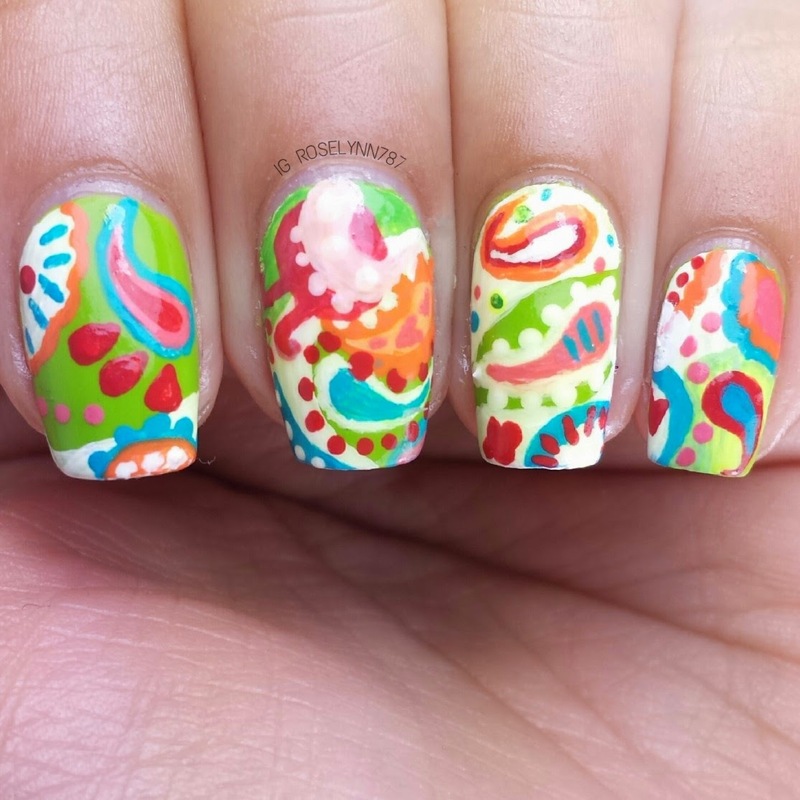 Oh my gosh, THOSE PAISLEY NAILS ARE AWESOME!!!! I wish I had the talent to do that! I'm thinking about getting some nail art brushes (as those stupid Sally Hansen nail art pens just aren't cutting it! ), so I look forward to your review on the brushes you used!